There are not such strong indications that an unhealthy diet increases the risk of depression. But there are indications of the opposite: a healthy diet reduces the chance of depression. This appears from a Spanish meta-study, which epidemiologists from the University of Navarra published in the Journal of Affective Disorders. The researchers collected 29 previously published studies in which researchers recruited groups of people, charted their dietary patterns, and then followed them for a longer period. We're talking about prospective studies. The researchers then aggregated the results of the studies and re-analyzed them. As far as the researchers could see, there was no clear connection between a bad diet and depression. Contrary to what you might expect, people who ate much intensively processed industrial foods [Pro], junk food [JF] or fat and sugar [F + S], or had a 'typical Western diet' [We] were not significantly more often diagnosed with depression. At the same time, a classic healthy diet [HD] protected against depression. A healthy diet, for example in the form of a Mediterranean diet [MedD], reduced the risk of depression by about 22-36 percent. An anti-inflammatory diet reduced the risk of depression by 19 percent, a relatively high intake of fish by 18 percent and a high intake of vegetables by 14 percent. J Affect Disord. 2018 Jan 15;226:346-54. Depression would become less common if we were all to stop using diet margarines and went over to using olive oil. 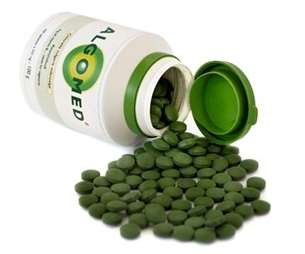 A daily supplement containing 1800 mg Chlorella vulgaris speeds up recovery from depression, according to an article that Iranian researchers published in 2015 in Complementary Therapies in Medicine.